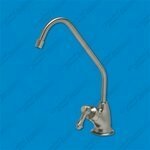 Upscale designer "AIR-GAP" faucet an elegant long reach solid brass Reverse Osmosis faucet features a smooth quarter turn handle with a ceramic seat for a lifetime of service, the angle of the handle is adjustable. A 1" hole is all that is needed for the faucet stud (all series), but a cover plate is included to accommodate larger pre-drilled holes. It is 8.75" tall and has a swivel spout with a reach of 5.5". For 1/4" tubing. Faucet color: Brushed Nickel. (NOTE: for Reverse Osmosis systems with airgap connections only, faucet has three connections). Elegant long reach solid brass faucet. If you have any questions about this product by Crystal Clear Supply, contact us by completing and submitting the form below. If you are looking for a specif part number, please include it with your message.